Wash and soak rice and gram in water separately for 2 hours. Now mix these two batter and add salt. Cover and keep aside for 6-8 hours for fermenting. Heat 1 cup of water in a microwave safe idli steamer on high for 2 min. 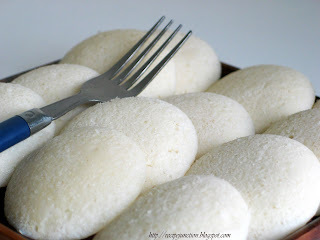 Grease the idli moulds with oil and put 2 tablespoon of batter in each mould. Cover with a lid and microwave on high for 3 min. Let stand for 2 min and unmould.